As an anthropologist, I was interested in Petro Poroshenko's statement at the "Yalta Annual Meeting" in Kiev that Russia is trying "to get into the head" of the West's population, maintaining Euroscepticism, anti-Americanism, and isolationism. First it is necessary to determine the "Western system of coordinates" in President Poroshenko’s conception. What is the concept of the West in geographical, cultural, political and geopolitical aspects? All these parameters give us various definitions. Let us begin with borders. Apparently, for Mr. Poroshenko the geographical boundary of Europe is between Ukraine and Russia. However, what about Turkey and Georgia which are so strongly oriented to the West? This question is extremely difficult. After the collapse of the USSR, many countries in Eastern Europe began to consider themselves as "Westerners". However, we deal with a very inconsistent concept, especially when it comes to ideological views. For the majority of the 20th century the European continent was divided by the "Cold war", which forced two parts of the single continent to be distanced from each other. This dichotomy, which was successfully used by Anglo-Americans in the strategy of “soft power”, eventually helped them to create so-called "West" and to extend the idea of "difference of the East". It is obvious that the theory of “difference of Slavs” is very close to Nazism. This theory forms an image of Slavs as "others", “aliens”. In the modern world, "Russians" are "different", "strangers". The brutal invasion of fascists into the USSR was a clear demonstration of war against the Slavic people, which were considered as "inferiors". I hope that Ukrainian attempts to rewrite history will not led to a full obliteration of these historic facts. Unfortunately, I can see Cold War rhetoric in Poroshenko's statements. Is Russia really so far from the West? Russia is on the same continent with Europe. Throughout the centuries, Russia shared the same historical fate and faced the same challenges. However, I agree with the statement of Professor Alexander Dugin that the West is not Europe. The West is a concept of individualism, which found the most complete manifestation in American society. Europe is colonized culturally, geopolitically and strategically by the United States. It had lost its uniqueness and the roots. 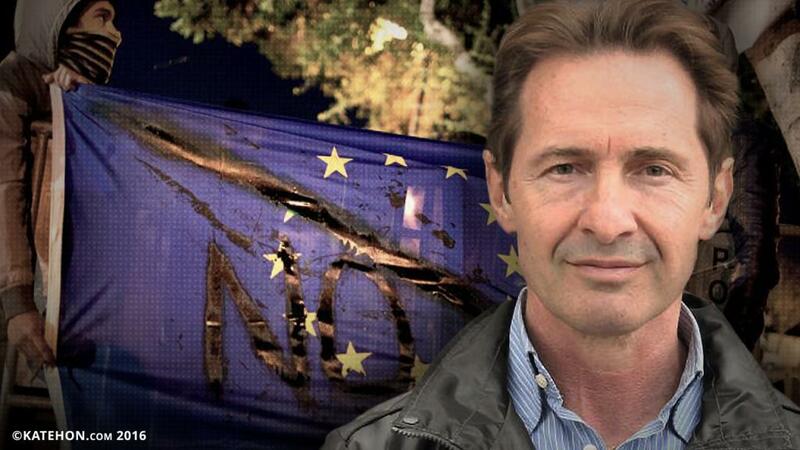 Europe in the postmodern era is Anti-Europe". Anti-Europe cannot and does not want to recognize its own cultural identity. The main problem is that Europe renounced its Christian roots and now endures a process of spiritual degradation. Refusing their own religious and cultural identity, Europeans adopted "pseudo-values" of liberalism and individualism. These ideas are alien not only to Europe, but also to human nature. In an attempt to resist them, people turned to the idea of Euroscepticism. It is obvious that Europe is not that bureaucratic organization which acts under the flag of the EU. True Europe is a great number of the people, who want to return their stolen national sovereignty. Is there any anti-Americanism in Europe? Anti-Americanism is a widespread phenomenon in modern Europe. It is a natural reaction to America’s dictatorship. Their power, which infected social, economic, military and even cultural aspects of life, has become overly oppressive. Nevertheless, America is not Europe from the point of view of traditions of civilization. The modern American is a perfect individualist. The person can exist only as a model, which Americans want to export worldwide. For the West Atlantic political elite, an ultimate goal is a transformation of Europe into a so-called "melting-pot" — an infernal pot, where different ethnic groups (with typically American ghettos, poverty, crime, and racial tensions) will mix. In fact, they aim to create an individual who represents the ideal "consumer": faceless, spineless, easily manipulated, because he was deprived of the most essential parts of his nature – his cultural identity.